A Filipino man is being deported from Britain because his wife, who died after childbirth, is no longer working here, an inquest jury heard. 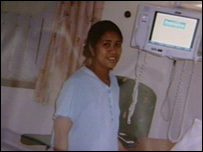 Arnel Cabrera's wife Mayra, 30, died after an epidural anaesthetic was wrongly injected into her arm in 2004. She died at Swindon's Great Western Hospital, where she worked as a theatre nurse. The baby survived. Swindon & Marlborough NHS Trust has admitted liability for her being given the anaesthetic intravenously. David Masters, the Wiltshire coroner, told the jury in Trowbridge that there had been two other deaths at hospitals in the UK in the last decade caused by the epidual drug Bupivacaine being administered intravenously. Mr Cabrera was told immediately afterwards by doctors that his wife had died from an amniotic fluid embolism, the inquest heard. But he learned later that she had died because Bupivacaine had been administered wrongly. Mrs Cabrera came to the UK from the Philippines in 2002, settling in Swindon with Mr Cabrera, 38, who was permitted to stay in Britain on the basis that she was working. Following his wife's death, Mr Cabrera was informed that, because she was no longer working, he had to leave the country as soon as her inquest had concluded. In a statement, Mr Cabrera said the family had come to the UK to find a new life. He said; "I was very angry I had been lied to for so long about how my wife had died. "Because she is the primary visa holder, when she passed away it also voided my permission to work in this country. It's a double blow I think."